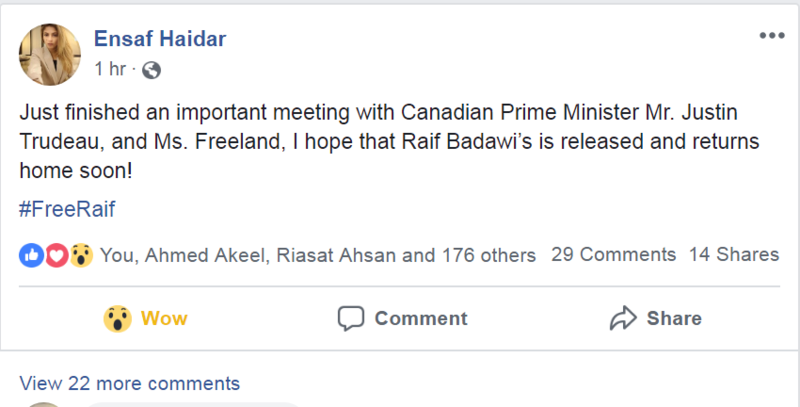 Maybe she just means she hopes Raif is released, as always…but then why mention the important meeting? More likely the important meeting was about some form of progress. So…here’s hoping. The journalists were probably there for a reason. Saudi Arabia is furious with Canada. The storm started with a tweet by Canada’s foreign minister last week expressing alarm at the recent arrest of a women’s rights activist in Saudi Arabia who had relatives living in Canada, and calling for her release. The activist is Samar Badawi, sister of Raif. On Monday, the Saudi government responded, with fury. The Canadian ambassador was ordered to leave within 24 hours, and the Saudi government halted trade and investment deals between the two countries. Saudi media reported that educational exchange programs would be suspended — affecting 12,000 Saudi students studying on state-sponsored scholarships in Canada. And Saudi Arabia’s national airline said it was suspending flights to Canada, beginning on Aug. 13. As of today, we received from a private source the sad news concerning the fact that the Saudi government will resume the lashing punishment against M. Raif Badawi. Our source is the same that informed us about the first 50 lashes M. Raif Badawi received in a public place on January 9, 2015. Our understanding of the information is that another series of lashes punishment will take place this time inside the prison. It appears that Saudi Arabia plans to resume flogging Raif Badawi. In a statement, the Raif Badawi Foundation said it had received the confirmation from the same source that had notified his family and associates about the first set of 50 lashes, which were served on January 9, 2015. The foundation did not specify who the source was. In contrast to the first round of punishment, which was performed in a public place, the next lashing was reportedly due to be carried out inside prison. Following injuries after his first flogging, Badawi’s remaining 950 lashes had to be postponed indefinitely. Reporters Without Borders says Raif could be released soon. So this is good news, and could be a sign of more good news – The Montreal Gazette reports that Raif Badawi’s sentence to flogging has been suspended. A jailed Saudi blogger is having his sentence of 1,000 lashings suspended, the Swiss Ministry of Foreign Affairs told newspaper La Liberté. “A pardon is now underway thanks to the head of state, the king Salman bin Abdulaziz al Saud,”State Secretary Yves Rossier told the Swiss newspaper. A nice thing today – the mayor of Sherbrooke made Raif Badawi a citoyen de Sherbrooke. The cruel and unjust sentence passed on the Saudi blogger Raif Badawi, 10 years in jail and 1,000 lashes, has been upheld by the supreme court in Riyadh. Hopes that the court might reduce or even commute the sentence, particularly as the holy fast of Ramadan begins next week, have been dashed. The only remaining appeal now is to the Saudi monarch, King Salman. From Quebec, where she has been granted asylum with their children, Mr Badawi’s wife Ensaf Haidar has said that she fears the public flogging – 50 lashes at a time every Friday after prayers – might resume as soon as this Friday. Ensaf Haidar posted a photo. with Joan Baez singing “I shall be released” #FreeRaif!! Ensaf Haidar is in Norway, and keeping us posted. Norsk PEN also updates us. Ulrike Lunacek, the Vice-President of European Parliament, stood up for Raif Badawi today, according to Ensaf Haidar. She’s the one facing us, in the blue scarf.